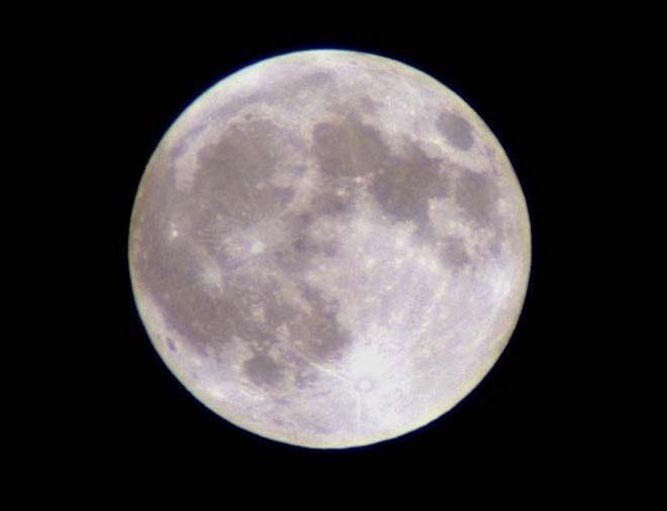 This year Halloween won't simply be All Saints Eve, it will also be a full moon, a BLUE moon. For those that don't know, a blue moon is the second full moon within the same month and that isn't a common occurrence. Thus, this year ought to be fraught with especially spooky stuff. It isn't just because the calendar states the obvious; it'll also be because I'll make it so. There's nothing like having a kid at the right age who is susceptible to a good scary yarn. Today we began our preparations for Wednesday evening. I waited until today to carve the pumpkins because I had worried if I did that too soon they wouldn't be worth anything when the real day came. Bought the pumpkins just over two weeks ago. There was a purchase of three, a Momma pumpkin, a baby pumpkin, and a BIG daddy pumpkin. Elaborate plans were made for all three along with the many smaller gourds we had purchased and arrayed around our prizes on the front step. At 8 AM, even after last night's changeover from Daily Light Savings Time back to Standard Time, the KID was ready to begin. Of course I wasn't and was able to put her off only until 10 AM. It was a good thing I didn't wait any longer since I had no idea of the effort this would take. It's only carving a pumpkin after all. Out of the two books of pumpkin carving designs I'd bought, Erin selected half of them. Then I managed to get her to settle on one. I didn't realize until after we began that this one was dubbed "challenging." Oh heaven help us. I brought in the "Momma" pumpkin which was about 20 pounds and proceeded to make the top and clear out its innards. That wasn't a huge problem but the thing was heavy. Then, after reading further in the instructions, the insides had to be pared down or shaved to a one-inch thickness. This was more work and with a frenzy of a small sharp spoon. Finally it was cored to the proper thickness. The pattern was taped on and a connect-a-dot sort of thing followed. You punch your holes evenly along the lines. This kept the child busy for almost an hour. Then it was my turn again with a little saw included with the kit. 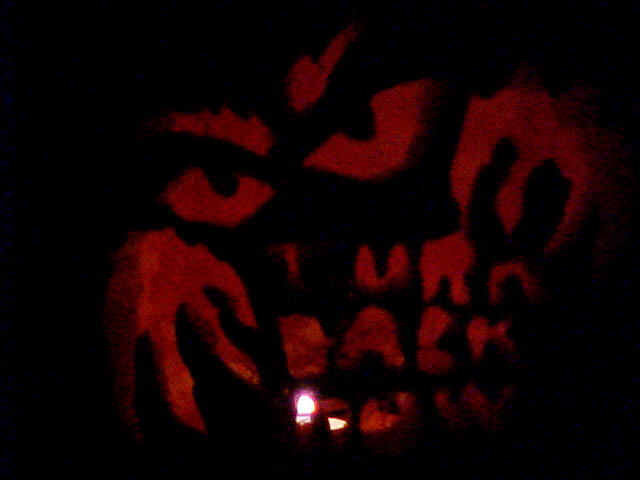 The design was one of spooky eyes and gnarled hands with a legend of "TURN BACK NOW." My hand was about to fall off by the time I finished this and I had worried the entire time that the entire front of the pumpkin was going to cave in. Luckily that didn't happen. Then I begged for an hour's respite just to rest my aching hands and back. Then it was time for "Big Daddy" pumpkin. This time I made sure the pattern was less demanding, a moderate one. This one was of a grave marker with a full moon and another set of scary hands. However, this time it was tougher. It wasn't just that the larger pumpkin was heavier, although that nearly put my back out as I was trying to cull the insides of the thing. This pumpkin was nearly "gourd" status, which means it had gotten tough, nearly brittle, with little flexibility and a three-inch thickness. I should have known to begin worrying, but after the success of the first one, I simply forged ahead. Again we did the drilling with the little plastic doo-hickey. Once she tired I finished it. Then came time for the saw. I won't say that I was over enthusiastic or even hard on the pumpkin. My hands and arms were already tired, but by the third cutout the entire front gave way. Luckily my daughter had become bored with it all and had left the room. What was I going to do? Toothpicks saved the day. Now this pumpkin won't last long, but it ought to get me through the next few days before it magically disappears. When it goes bad in the dramatic way it will, I'll likely tell Erin that a greedy ghoul from the beyond decided they simply had to have it. This year, again, I will be dressing up to frighten those that arrive at my sister's house and I'll be bringing the scary music, all the candy, and we'll play more than a prank or two. Hours will be spent getting ready and helping others get prepared in outlandish costumes and strange makeup. The tales we will conjure up about this special Halloween with the blue moon ought to be enough to frighten our nearly "grown-up" nieces. The candles will flicker and our eyes will bulge. Our laughter will cackle in gleeful wickedness. And for a very short time, all in the house will believe our tales of demon possession, witches, goblins, and every ghost story we can invoke. All the while the little ones knocking at the door will get the best commercial candy around—Snickers®, M&Ms®, Nestle®, Hersheys®, Reeses®, and all the rest. Meanwhile, I wish to you all a ghoulishly good time come Halloween. Be sure to remind all those you know just how weird this night of darkness should be. On a full moon, anything can happen—simply anything! Remember, it's not just for the kids anymore! Heehheheheheheeheeee!